The twin challenges of modern life are: keeping warm in winter and reducing your carbon emissions - one way of achieving both is to buy a woodland and install a wood burning stove at home! Having owned a woodland for many years, I recently decided the time had come to for me to switch our heating to log burning, so I set about asking friends and researching which stoves were best and how it would all work. You will find that asking about heating is one of those secret conversation topics (a bit like asking a group of men what women really want) that gets everyone going and you can pick up lots of practical advice this way - about stoves, not women. In preparing for our stove my first action was to get the chimney swept (cost £50) and get a certificate from the sweep so that the installers would be sure that it was safe and had a good upward draught. Chimneys are not just a way for air to escape: they are a scientific way of creating a fast flow-through of oxygen - as the warm air rises is pulls more air behind it and this in turn pulls more oxygen over the fire so that even more hot air is created. My chimney sweeps, Mr Pearce and his son, have built on a long family tradition of sweeping chimneys in South London and they point out that you need the chimney re-swept every year (twice if you burn coal, which I won't). 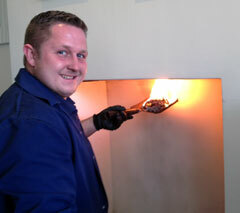 Mr Pearce junior burnt some newspaper at the bottom of the chimney to make sure there was a "good pull" of air. Choosing a suitable manufacturer, size and colour of wood burner. 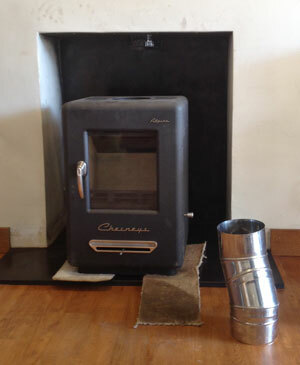 The stove I chose is an "Alpine" model from Chesneys, who are based in Battersea. (cost about £2,500 plus £700 for installation). We got a 10% discount for ordering late in the winter and for paying a couple of weeks before installation. I opted for a model that gives off a lot of heat, with an output of 6 kilowatts, and went for the matt black colour - with most other colours your stove will either look dirty or you will be continually cleaning it. In the early days of stoves they would all have been black but this didn't stop them selling in vast quantities. Stoves were the first mass-produced products of the industrial age and in the 1830s huge numbers were made in the US and by 1840 there were 200 factories producing cheap stoves for mass consumption. The main selling point of these stoves was, and still is, that they are sealed units, reducing fumes and the risk of house fires but also crucially giving control over the air inflow, allowing you easily to control the speed of wood burning. 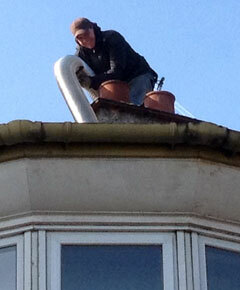 Lining the chimney with a flue liner to stop carbon monoxide escaping. According to the HPA (Health Protection Agency) in the UK about 40 people each year die from carbon monoxide poisoning, so it's essential to make sure that the fumes don't leak through any holes in the brickwork which would release carbon monoxide. The safest way to do that is to get your stove installed by a professionally qualified firm and they will usually line the chimney with a long pipe (a flue liner). They do this from the top as it's much easier for them to have gravity on their side so the installers climbed onto our roof and fed the tube down the chimney. Each end needs a special adaptor - at the top it's to keep out rain and birds and at the bottom to connect onto the stove itself. We had put in a slate slab to put the stove onto but it's so heavy it doesn't actually need to be fixed down. 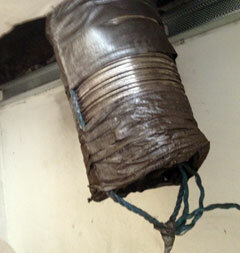 The attachment to the flue would in any case prevent it from moving. Once it was in place it was ready to start burning and the installer, Rhys, showed us how to light it: he used couple of organic firelighters, then put a couple of scrunched up sheets of newspaper on these and then built a wigwam of kindling above. Within minutes of lighting it was ready for its first log and it's been eating logs for the last week but also keeping the whole house toasty warm. We've not had our gas central heating turned on since installing the stove. More woodland visits needed to cut logs for the fire! Now that our wood-stove is up and running the challenge is to find enough wood fuel and enough dry logs to feed it with. They say that ash doesn't require much seasoning and that some logs burn better than others, but our main plan is to pick up enough wood fuel during our summer visits to our woodland to be able to feed the fire all through next winter. 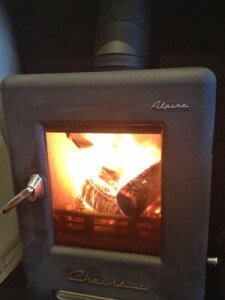 We hope to achieve our goal of keeping warm and to reducing our carbon emissions, but we've also noticed another thing about wood fuel: many of our friends have also installed wood burning stoves and they also now want to visit our wood with us to collect firewood for their own domestic heating. Like you I got the wood first then decided it was silly not to have a woodburner. A fallen ash has provided all my firewood this winter and to be honest my heating bills haven’t fallen significantly BUT what a comfort during this long winter to have a “proper fire”!! So no regrets about the £2K outlay! Looking at taking down another ash ASAP for next winter’s supply! We have a wood burner which certainly keeps the gas bills lower and to relax watching the dancing flames what better. I would add though Sarah Walters mentions a fire of 4k and above needs an airbrick, I believe that it is 5k and over requires additionally source by way of an air vent, my fire is 8k and I have a 4 inch hole through the cavity wall in the room with the log burner installed. I would love to buy a woodland and one-day maybe I will. Nice article. It would be worth pointing out to readers in a smoke control zone (basically anybody living in a town) that they have to install a DEFRA complaint stove, and cannot just go out and buy a standard wood burning stove. These compliant stoves are designed to minimise pollution, particularly small particles, and this is essential in urban and suburban areas. It is also worth mentioning that a 6kw stove requires an air brick to be fitted in the house. Anything up to 4kw can be fitted without an additional air brick. The DEFRA web site has a list of compliant stoves from different manufacturers.